Leicester Tigers, one of England’s most successful rugby union clubs, invested £8million to redevelop the west side of its Welford Road stadium in 2015, including a new West Stand which replaced the historic Clubhouse building. The three-storey building now houses 3,100 seats, as well as the club offices, match-day ticket office, a Tigers match-day retail shop, stadium big screen and the premium Clubhouse season ticket lounge. Completion of the stand brought the stadium's capacity to just under 26,000 and its unique shape helps to cement Welford Road's reputation as one of the most iconic homes of rugby. As the best and most exclusive season ticket lounge at Welford Road, the Clubhouse season ticket lounge within the West Stand is the only room in the stadium with pitch views directly from the lounge. It features a unique terrace area which opens up through bi-fold doors, providing an outdoor space to watch the match or to simply appreciate the surroundings on non-match days. Stuart turned to his local Dimplex specification manager, who completed a site survey and specified five Dimplex QXD3000 Quartz heaters. The QXD range uses radiant heating to heat people directly, rather than wasting heat directly into the air, with instant operation and silent running. Each heater on the terrace is connected to a time delay switch, to improve efficiency and ensure easy operation only when the heaters are needed. In the absence of a regular contractor, Dimplex also recommended trusted installer partner MM Electrical & Shopfitting Contractors Ltd to complete the installation – providing a full end-to-end response for the client, all in the space of three weeks to meet a deadline for the next home match. Stuart Barnes added: “Overall it was an excellent service and we’re delighted with the end result. The QXD heaters give our corporate visitors and season ticket holders the warmth they need to be able to enjoy the terrace all year round, whilst by making use of the time delay switches we can keep running costs to a minimum without having to rely on staff to turn them off. Howard Fincham, specification manager for Dimplex said: “Quartz heaters provide the ideal solution for heating outdoor space because of the way in which they use radiant heat to heat people and objects directly, rather than heating the space. 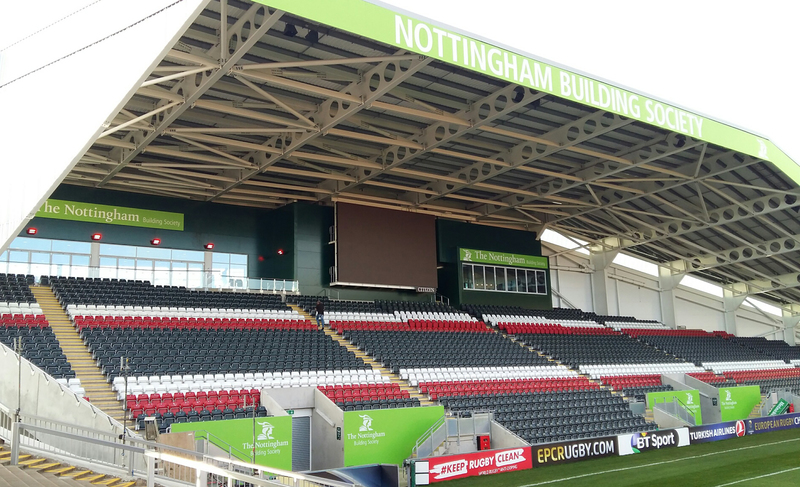 “They are already a popular solution for outdoor dining and smoking areas in the hospitality industry and it made perfect sense to specify the Dimplex QXD heaters for this requirement at Welford Road.